A restroom in a business plays a very important role in the success of the business. The staff of the company feels happy with a good restroom. Business restroom checklist is such a document which is used by the owner of the business for keeping track of the restroom facilities and to check whether they are being provided or not. It also keeps track of the employees who have been given the responsibilities to make all the facilities available to the people coming in a restroom and to do the accountability of the employees who are performing their duties well. With the help of the restroom checklist, you can keep track of all the services frequently. Check all the rules and the services which should be provided to the restroom and also see the cleanliness and other services in the restroom. It should be checked that minimum how many times the cleanliness and other services should be checked through the business restroom checklist. Since the restroom has the most of the traffic of the business so it is very important to keep track of the condition of the restroom after the regular intervals of time. You can manage all the services and the facilities of the restroom with the help of the business restroom checklist. Some of the checklists are available on the internet free of cost which you can use if you don’t know what contents should be added to the checklist. The clean-up services of the restroom can also be managed with the help of this checklist. 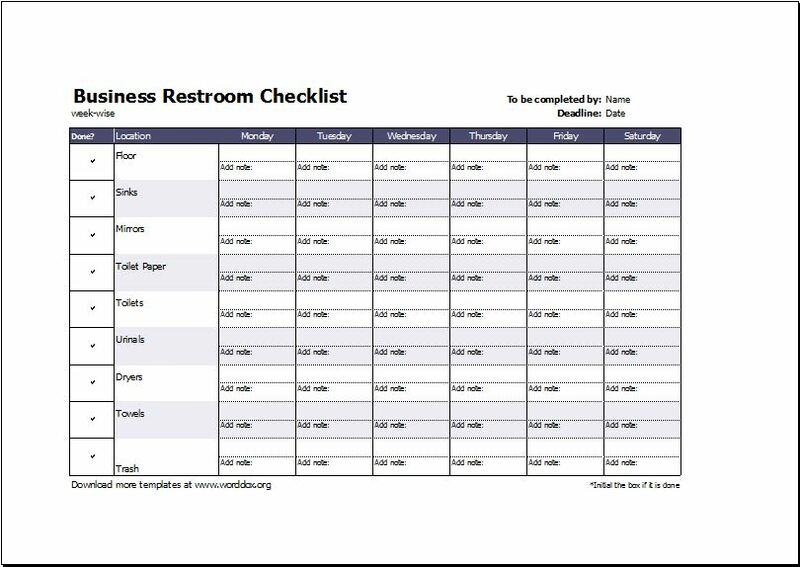 This is business restroom checklist template designed in MS Word software. This is simple checklist which works for a complete day office cleanliness. 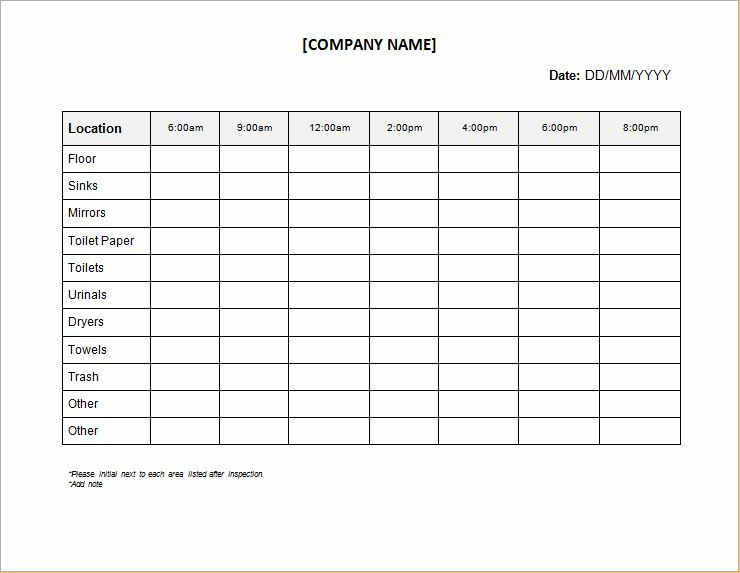 Add company name at the top to customize this sheet. Add date for which the record is going to be maintained. You can add a complete list of ‘location’ that is to be monitored along with different timings throughout the day. You can customize timing as per your cleaning schedule. Anyone can be assigned a duty to initial the box in front of each location to be cleaned at mentioned time. This is Microsoft Excel format cleaning checklist designed for weak-wise cleaning. Different locations are mentioned in the sheet along with ‘initial’ and ‘add note’ columns. This sheet helps in keeping a record of cleanliness for a complete week. Prepare multiple sheets to keep a record for a longer period.